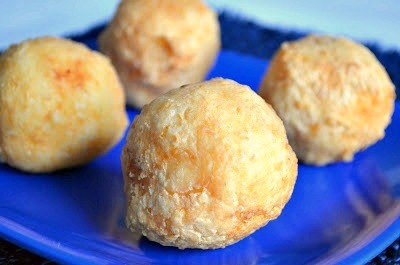 Rice Balls (or Arancini as they are more formally called) were always my grandmother's specialty. When we used to venture up to New York for the holidays, she would have trays of these little suckers just waiting for us. Now that I've tried to make them myself, I really commend her for making so many. Like well over 50. I'd be lucky if I could make two dozen. They're time consuming to say the least! This is the recipe I received from my grandmother (Angie). I love how recipes were so uncomplicated back then. Basic instructions with no way to really mess it up. I wish things were still like that. Instead, I'm now faced with recipes that have at least 20 steps and give me a mini-stroke. But even though this recipe takes quite some time and can drive you bananas (especially if the balls fall apart while you are frying them) the end result is worth the wait. I suggest making the rice, and then letting it cool just slightly before forming the balls. But make sure you pack the rice really tight or else they will fall apart (trust me). The soft texture of the rice and gooey cheese surprise in the middle is the best. If we weren't eating these on Christmas Eve I would have made the version that included meat and peas on the inside instead of just Mozzarella. Maybe next time. You can also use Italian breadcrumbs in place of the flour for some texture. I'll probably do that next time as well. Enjoy! Cook rice according to package directions. Do not overcook. When done remove from heat, add salt and butter and stir to combine. Allow to cool slightly. Add Parmesan cheese and 6 egg yolks. Stir to combine. When cool enough to handle, take a small portion of the rice mixture and firmly pack it in the palm of your hand. Place 1-2 chunks of Mozzarella in the middle and then cover with the same amount of rice. Press firmly to form the ball. Whisk the egg whites in a small bowl. Add the flour to a separate bowl. Dip the balls in the egg whites and then into the flour. Shake off any excess. Add enough oil to a pot so that it rises 4-5 inches in a dutch oven or heavy bottomed pot. Heat the oil so it reaches 350 degrees F. Add 2-3 balls to the oil and cook until lightly browned, about 4 minutes. Use a slotted spoon to remove the balls from the oil and place on a paper-lined plate to cool. Repeat with remaining arancini. Serve with marinara sauce, if desired. I love that you have a recipe in your grandmother's hand! What a treaure. These look and sound yummy.